Explorations in Quilting and Life: Exhibit on Fire! There is an exciting fiber art show in the Denver area if you are going to be anywhere near there before October 8. The show, On Fire, is by Regina Benson and is on view at the Ice Cube Gallery. I am slightly frustrated as I won't be able to see it in person. However, one can gain some sense of the uniqueness of this exhibit from some excellent reviews and photos on the web. Benson colored the cloth through an elaborate multi-step process, with the results having the look of burning embers. She begins by dying the fabric numerous times in colors including red, yellow and black. To create the illusion of something burning, she discharges the dyes to different color saturations ranging from amber to black. Benson lays the fabrics on the snow outside her studio, then applies hot liquid containing sulfur applied with a brush or a sprayer to partially remove the dyes until the desired tone is achieved. The melting snow underneath the fabric is also used as part of the process. As the snow melts, the fabric wicks up the water and further dilutes the dyes in places, thus changing the colors in those spots. If you can view the show, I suspect you will come away impressed. 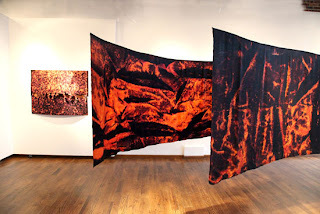 At the least, I suspect that you can share in my admiration for this amazing fiber artist who is able to express her vision in such dramatic and complex methods. Fascinating processes...thanks for sharing this Judy! Wish I could see it in person, too!